For those who enjoyed the last thrilling instalment of life on the open road with the Hatch family – 2011’s Are We Nearly There Yet? (with my review here) – I should stress that the follow-up – Road to Rouen – involves a major change. On the face of it, there are many parallels. Last time it was an 8,000-mile child-friendly tourist-attraction led UK tour based around free accommodation, financed by a leading guide-book publisher, whereas this time it’s a 10,000-mile epic family holiday around France, with similar levels of blagging and freebies. But this time – wait for it – the family’s coveted master travel document holder, Ben Hatch, son of late, great BBC comedy writer and producer Sir David Hatch, reckons he’s learned from past mistakes and is doing things entirely different. Different in what way? Well, he’s swapped a chaotic suitcase-led packing system for a far superior inter-changeable ‘squishy-bag’ model, to avoid those strategical heavy-baggage nightmares struggling to locate vital items at key moments. So what can possibly go wrong? I don’t need to continue that thread. You get the picture. Lots can go wrong, and does. But this is no second-rate farce based on taking the piss out of the French (although there’s a fair bit of that) and wacky adventures (despite a few of those too). It’s far more than that, thanks to a style of writing which -like the first instalment – offers echoes of Bill Bryson and Michael Palin at their rib-tickling best. 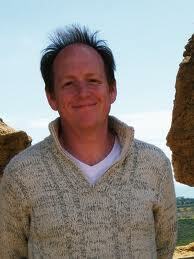 What’s more, it’s based around real-life characters many of us will empathise and sympathise with. This time, Ben and his very patient wife – travel journalist Dinah – have slightly-more rebellious trip-mates, with their children Phoebe, 7,and Charlie, 4, now slightly older and wiser. Other than that though, much of the premise for the last best-seller remains – not least the mammoth proportions of their challenge and resultant wear-and-tear threatening the stability of the family unit – something no amount of free hotel stays, meals and tourist spot excursions can hide. If last time’s trip left us feeling drained and so glad it was them and not us making the journey, this is no different. But even when Ben and Dinah’s under-pressure relationship threatens to break down beyond repair, you’re still on their side. In short, this is a family you know you’d get on with – however much of a nightmare they seem at times. For Road to Rouen they swap a smelly Vauxhall Astra for a soon-even-smellier VW Passat with quite a lot of unnecessary cheese on board. And as it is, I’m gone within a couple of pages as our patriarch describes a semi-emotional goodbye to his family’s Brighton home, while conspiring with Charlie to tackle an annual ant infestation with the help of a freshly-boiled kettle (while Dinah’s not watching). Soon, our Hatch heroes are on their way, despite the fact that Ben speaks no French, heading for the Newhaven-Dieppe ferry and a three-month summer adventure that’s part car-crash-TV and part tribute to the parents’ love for each other and their children. And while this is no pass-the-sick-bag sentimental journey, there are plenty of chances to feel groggy en route. The opening piece about the ants is just one of many high-comedy pieces by the author, and this is one of those books you can annoy the hell out of your friends with. In my case that involves laughing out loud then reading sections back to my better half, who after a few such encounters gets the huff as ‘it’ll be pointless me reading it soon’. In a similar vein, I should mention the section further in where she woke up one night to find the bed shaking as I tried to suppress a fit of giggles at one description (well, that’s my story, and I’m sticking with it). Soon the Passat is falling to bits, with a golf putter (one of four brought along so they can sneak on to crazy golf courses without paying) needed to stop a rusty-hinged boot cracking your head, and the glovebox propped shut by a tea flask to avoid the interior light flattening the battery. And then there’s the cheese. In this state, the family take in Normandy, the Loire Valley, Brittany, and all points beyond, weighed down with everything from a tent to wedding outfits and Postman Pat costumes (find out for yourself). Amid this perfectly-executed travelogue there’s the back-story of an often-tempestuous relationship between two rather-obsessive grown-ups – brutally honest at times – as Ben waits anxiously to see if his novel will be published, Dinah worries about her plans to re-train as a French teacher, and the couple try to work out how best to tackle the rogue builder who stitched them up before their departure. But whatever lows they encounter, their relationship pulls them through, just as it did amid the emotional turmoil described in the first book as Ben came to terms with losing his parents. While that’s at the heart of the story, it’s those great comic moments that keep us turning the pages, and at times you sense the panic in the over-officious tourism officers as the sometimes-challenging, certainly characterful Hatchlings Charlie and Phoebe reign supreme in their temporary homeland. There’s added help too at the end of the telephone or via FaceTime from Ben’s brother Buster, the BFBS broadcaster, taking over his Dad’s role with the odd subtle rollicking to help keep the family peace. That includes the section I earlier alluded to. In a bid to avoid any spoilers, I’ll just say it involve’s Buster’s verbal response to Ben’s solo venture across the Spanish border, involving drug-induced paranoia, the running of the bull at Pamplona, the supposed heir of a tinned soup empire, and a few potentially-vicious dogs – all set to an unidenitifiable Rolling Stones soundtrack. Our Hatch quartet can’t stay in France forever, and for part of this story don’t even want to be there – with Dinah missing Radio Four, Stephen Fry and Yorkshire Tea. But I’m not giving away too much by saying they struggle on long enough to Carry On Up The Champs-Elysees, however gruseome at times. From sat-nav disasters to scary moments on the Rouen one-way system and driving in central Paris, from non-child-friendly D-Day documentaries in Normandy to regular battles with Gallic bureacracy, with far too many visits to chateaux and vegetable-themed museums, battles with swimming pool attendants, heavy donkeys, canoes and Alpine turbulence, religious and spiritual weirdo spotting at Lourdes and Bugarach, and smuggling pre-filled baguettes into Disneyland, it’s all there. So what’s not to like? 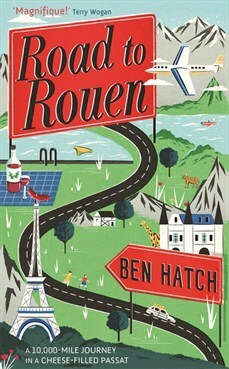 Road to Rouen by Ben Hatch is published by Headline, available from all good bookshops and internet outlets, and probably a few shoddy ones too. This entry was posted in Books Films, TV & Radio and tagged are we nearly there yet?, ben hatch, Bill Bryson, Brighton, david hatch, Dinah Hatch, France, Michael Palin, Pamplona, Paris, Road to Rouen, VW Passat. Bookmark the permalink.